Exuding a timeless appeal, the Casio AMW 703D 1AV Outgear Men’s Black Chronograph Dial Stainless Steel Band Watch is perfect for outdoor activities like fishing. The watch’s unique fishing mode shows the best time to fish by keeping track of the phases of the moon. This state of the art watch displays time in both analog and digital formats. It incorporates 2 analog hands for hours and minutes, which move every 20 seconds. Displayed at 6 and 3 o’clock are the hours, minutes and seconds in digital format. This timepiece displays the temperature at 12 o’clock, day of the week at 9 o’clock and the fishing level indicator in between. The watch can display the current temperature in both Celsius and Fahrenheit. Its auto calendar automatically adjusts the displayed date and even includes the months of a leap year until the year 2099. The full face LCD of the watch displays all the above information using easy to read characters. An auto electroluminescent backlight illuminates the dial simply when the arm is angled towards your face. This manly watch shows the current time in 50 cities in 30 time zones with daylight savings. Its countdown timer can accurately measure split, elapsed, and 1st and 2nd times. The watch also facilitates setting daily alarm on it. The Casio AMW 703D 1AV Outgear Men’s Black Chronograph Dial Stainless Steel Band Watch features a sturdy design that exudes masculinity. It features a sturdy metallic construction with a sleek black face. The case’s outer ring has prominently marked directions. Its four function buttons are placed conveniently well within the reach of your fingers. Its black dial encased in a sturdy stainless steel case. A durable, scratch resistant mineral glass protects the face of the watch. The band is also made using high quality stainless steel that lasts for a long time to come. The Casio AMW 703D 1AV Outgear Men’s Black Chronograph Dial Stainless Steel Band Watch prominently displays the current day and date in digital format. The display is placed at 3 o’clock of the watch. Its auto calendar automatically adjusts the displayed date, including the months of a leap year until the year 2099. The Casio AMW 703D 1AV Outgear Men’s Black Chronograph Dial Stainless Steel Band Watch is resistant to water to up to a depth of 100m. You can conveniently wear this timepiece while swimming, showering, or diving to short depths. The Casio AMW 703D 1AV Outgear Men’s Black Chronograph Dial Stainless Steel Band Watch features a rugged stainless steel band that not only looks cool, but is also extremely durable. 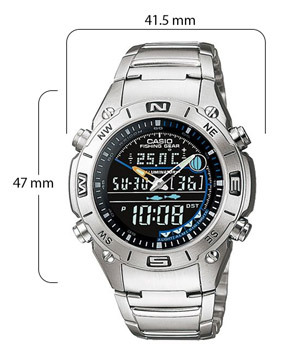 You need to insert 2 SR927W button batteries in the Casio AMW 704D 7AV Outgear Men’s Digital Dial Stainless Steel Band Watch. These batteries last for up to 3 years. Description Product Features:Target Group: MenBrand: CasioModel Number: AMW-703D-1AVWatch Type: Sport WatchWatch Shape: RoundMovement: QuartzDisplay Type: Analog-DigitalDial Color: BlackDial Window Material: Mineral CrystalCase Material: Stainless SteelCase Diameter: 41 mmCase Thickness: 12.8 mmBand .